The Texas Collection is a Texas Regional Historical Resource Depository (RHRD) library. 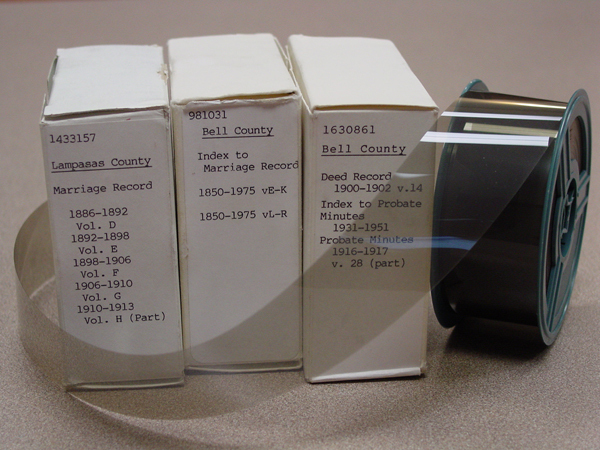 As one of 23 participating libraries in Texas, we receive the microfilm records of selected counties in our area from their Local Records Division. Clicking on a county name will send you to the Texas State Library system where the county indices can be browsed online. The loan of microfilm under the RHRD program is subject to the following policies and conditions of use. These policies are implemented to ensure the availability of the film to researchers on a timely basis and to protect certain rights vested by law in the custodians of the original records. No more than five (5) reels of microfilm may be on loan to a library at one time. *Note: The Texas Collection loans microfilms solely to other libraries and does not loan microfilms to individual researchers. Microfilm is loaned for a period of up to two (2) weeks, but the period may be extended for an additional one (1) week if no other request for the microfilm has been received. The State Archives Division of the Texas State Library, a regional historical resource depository, or requesting institutions are not permitted to provide certain copies of documents on microfilm. If a certified copy is needed, the researcher should obtain it from the county clerk or district clerk who is custodian of the original record. The current custodian of the records of the county superintendents of schools is the county clerk. The microfilm is for in-library use only. Under no circumstances is it to be removed by the researcher from the premises of the requesting institution. Please contact The Texas Collection directly to arrange an interlibrary loan.